Euro/dollar lost ground for a second week in a row, as Spain’s issues worsened. Also Greece isn’t doing that well, and the global slowdown also takes its toll. The upcoming week is the first for the last quarter of the year, and it features many events. The rate decision is the most important one. 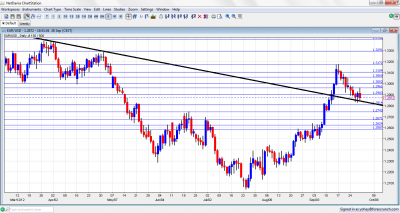 Here is an outlook for the upcoming events and an updated technical analysis for EUR/USD. Spain was the epicenter of the crisis once again: the new austerity budget is expected to be sufficient and prevent new measures when the bailout request will finally be made. The bank stress tests showed a need for 59.3 billion euros – not a scary number. However, Germany, the Netherlands and Finland backed down from an agreement that recapitalizes the banks directly using the ESM. The banks could still be a burden on the Spanish state. Regarding an agreement between Greece and its creditors, there is still a lot of uncertainty, with conflicting reports of progress and of troubles in the talks. How will this end? Spanish Manufacturing PMI: Monday, 7:15. With Spain being in the limelight, this important figure also moves the currency. Manufacturing recovered from lower levels and the PMI reached 44 last month. This is still significantly below the 50 point mark separating growth and contraction. A small drop could be seen now. Note that the Italian manufacturing PMI will also be published at 7:45 GMT. This figure stood on 43.6 last month and is expected to tick up now. Spain is currently more important. Final Manufacturing PMI: Monday, 8:00. The initial estimate for September stood on 46 points. The estimate will likely be confirmed now, although a small drop cannot be ruled out either. Unemployment Rate: Monday, 9:00. The unemployment level stood on 11.3% last month. This bad situation will likely worsen with a rise to 11.4% now. PPI: Tuesday, 9:00. The ECB’s mandate is to maintain price stability. So, also the producer price index is of importance. After rising by 0.4% last time, a rise of 0.6% is expected now. Final Services PMI: Wednesday, 8:00. The services sector is also in the red and with the same figure: 46 points according to the initial estimate. A confirmation of this figure is expected now. Note that also here, Italian and Spanish figures are published before this final PMI, but the earlier manufacturing PMI gets more attention. Retail Sales: Wednesday, 9:00. The volume of sales in the euro-zone saw a drop of 0.2% last month. Expectations aren’t that much higher this time: no change. Rate decision: Thursday, 11:45, press conference at 12:30. There is a good chance that the ECB will cut the main lending rate by 0.25% as the economic situation continues deteriorating, and after it focused on the OMT in last month’s meeting. Signs of weakness are seen also in important indicators in core countries. In the press conference, Mario Draghi will likely focus on aspects of the OMT. Contrary to the LTRO, he will probably refrain from tapping himself on the back, despite already seeing lower bond yields. Final GDP: Friday, 9:00. The first release of GDP showed a drop of 0.2% in the output. A confirmation of this number is expected now, after Germany already confirmed its growth. German Factory Orders: Friday, 10:00. The euro-zone’s powerhouse enjoyed a steady gain of 0.5% in factory orders last month. And now, a correction with a drop of 0.4% is expected. After some choppy trading, €/$ rose but couldn’t breach the 1.2960 line (mentioned last week). After a drop, a second attempt failed to break this line, and the pair eventually ends the week on lower ground. 1.3615 provided support to the pair when it was trading at elevated levels back in the fall of 2011. 1.3550 served as a cap at that same period of time. 1.3480 is very important resistance: it was the peak seen in February. At the time, it was very stubborn. 1.3437 is of historic significant and is a minor line now. The round level of 1.34 is a strong cap after serving as such during March. 1.3290 worked as resistance for the pair during April and is also of importance. 1.3170 worked very well as a double top during September 2012 and is now the top frontier. 1.3105 provided some support in April and is a weak line at the moment. 1.3060, was a clear separator in May and also had an important role beforehand. It slowed the rally in September 2012 and is still very relevant. The very round 1.30 line was a tough line of resistance for the September rally. In addition to being a round number, it also served as strong support. It is now becoming more pivotal. It is closely followed by 1.2960 which provided some support at the beginning of the year and also in September. 1.29 is a round number that also provided support when the euro was tumbling down back in May. 1.2814 was the peak of a recovery attempt in May and also capped the pair in September 2012. 1.2750 capped the pair after the Greek elections and also had a similar role in the past. It is weaker now. 1.2670 was a double bottom during January and was the high line of the recovery before the Greek elections in June. It also capped the pair at the beginning of July 2012. 1.2624 is the previous 2012 low and remains important as also seen at the end of August, when it served as resistance. Below, 1.2587 is a clear bottom on the weekly charts but after holding the pair down for a while, but it is weak now. The line starting from February at the 1.3486 peak was formed in March and April. The rally sent the pair surging through this level, as the graph shows. The pair flirted with this line again and again, and a convincing break below this line could start an avalanche. The situation in Spain has worsened significantly. The new austerity measures will hurt the economy and raise social tensions, which are already at heightened levels as seen in violent protests in Madrid and the Catalan strive for independence. However, there is no carrot: the de-facto abandonment of the direct banking recapitalization scheme by the northern countries just adds to the burden. In addition, no big breakthrough is expected with Greece this week, and the Chinese slowdown is also aiding the dollar. While US figures remain mediocre and even slightly recessionary, and despite QE-infinity, the greenback remains a safe haven currency.